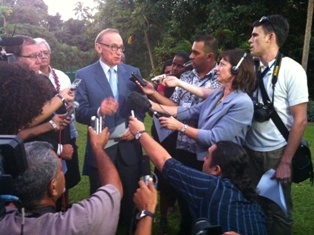 Australia’s Foreign Minister, Bob Carr, is among a delegation from the Pacific Forum that wound up a day-long series of consultations in Suva today with the Fiji Government, opposition figures, non-government organisations, trade unions and other civil groups. The communique below acknowledges, for the first time, that the Bainimarama regime is serious about holding elections in 2014 and has a cogent plan to deliver them. Unfortunately, it doesn’t signal any immediate change in the Forum’s hard line stance against Fiji. So called “smart sanctions” will continue to apply and Fiji will continue to be suspended from the Forum. Much will depend on the written report that the Ministerial Contact Group eventually produces for consideration at the next meeting of Forum leaders in the Cooks Islands in August. 9. Participants in the MCG visit were Hon. Murray McCully, Minister of Foreign Affairs of New Zealand, Senator the Hon. Bob Carr, Minister for Foreign Affairs of Australia, Hon. Ano Pala, Minister for Foreign Affairs and Immigration of Papua New Guinea, Hon. Fiame Naomi Mata’afa, Minister of Justice of Samoa, Hon. Apisai Ielemia, Minister for Foreign Affairs, Trade, Tourism, Environment and Labour of Tuvalu and Hon. Alfred Carlot, Minister of Foreign Affairs of Vanuatu. Who is Mr Carr an unelected minister in Australian Government to tell us what needs doing? I say we should give few seats to Military who can keep the future governments honest.